A mountain bike marathon, a mountain bike cross country race and today a road race. Every weekend there is another cycling discipline on my program. At least this was the case for the last couple of weeks. Changing discipline is not difficult. You ride a bike all the time. The only thing that changes is the way you have to use you head in a race. In a MTB marathon you have to stay focused for a very long time. Up to 5 hours of race time is demanding a lot of concentration. In a cross country race you ride full blast from the beginning until the end. In a road race thinking is allowed. 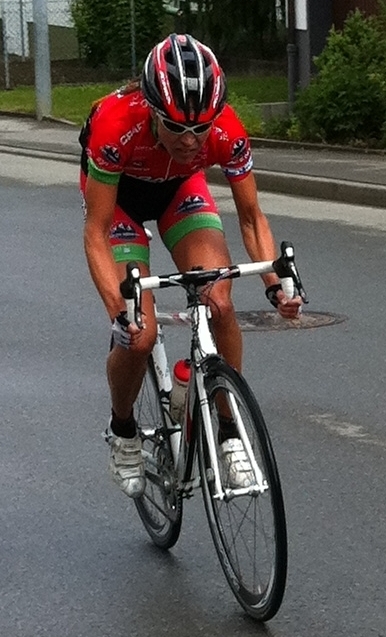 So today I was supposed to think in a race, I took part in a road race in Geislingen. This race was part of LSB-cup, a German road race series. The women’s race started in cold, rainy and windy conditions. I was freezing and as we hit the first climb (we did 5 laps in total about 60km) I accelerated and noticed to my big surprise that only two other girls could follow me. We continued together for one lap and as we hit the climb again I did another attack. This time I was alone. Now I started to think. Should I continue? Wait? I did not want to wait, I did also not want to continue full blast for another 45km. So I decided to do a middle thing. Ride the climbs hard and try to keep up the good speed in the more flat parts. This did not really work. It is quite a stupid way of thinking, because when you are out there with some riders chasing. What do you do? You ride full blast. After the race I did another 1,5 hours of training. Spinning my legs for another 40km just makes miracles. Now I feel so good and I am ready for the Worlds Ice Hockey final on TV. If you folks missed it; there is the dream final on TV soon,FinlandagainstSweden. Here you are not supposed to think. Just cheer for you own country! Go Finland!